Honestly i am surprised at it getting voted cold, if it is a good deal …Honestly i am surprised at it getting voted cold, if it is a good deal which it clearly is why vote cold? if people dont want to buy six then just move on? I am so bored of all the xbox 1 games but i dont vote cold if it is a good deal just because i dont want the deal. The Pink Sands one is £23.99 from the yankee candle site, obviously not many would buy them at full price and any deals they have will reduce further. The Pink Sands one is £23.99 from the yankee candle site, obviously not …The Pink Sands one is £23.99 from the yankee candle site, obviously not many would buy them at full price and any deals they have will reduce further. Yeah I see that. Problem is here, people vote based on the overall price, rather than the price each piece works out at. So a genuinely good deal can sometimes go freezing cold as the overall cost is too high for a lot of people to bite. I totally get it, the candles are brilliant for sure. For me personally …I totally get it, the candles are brilliant for sure. For me personally though, in the month of Christmas, I'd rather buy an individual one, UNLESS I was presenting them as gifts - in which case this is brilliant - I can't argue with the numbers :-)Yeah I see that. Problem is here, people vote based on the overall price, rather than the price each piece works out at. So a genuinely good deal can sometimes go freezing cold as the overall cost is too high for a lot of people to bite. LOL. I've been saying the same with all my Amazon purchases. My OH is banned from the office now as I have yet to wrap them! Honestly i am surprised at it getting voted cold, if it is a good deal which it clearly is why vote cold? if people dont want to buy six then just move on? I am so bored of all the xbox 1 games but i dont vote cold if it is a good deal just because i dont want the deal. "Will the masses A) like the price, and B) like the product, for that price". So, if it's too high, I just move on, despite it being a ruddy good deal. People got a lot when the glitch was on recently & they were about 8.00 each,but it probably is because of the high outlay in one go. Are they the cheaper versions,the home ones? The best "Deal" is a subjective* view of anything to do with the product thread (such as the merchant's past history, the non-guaranteed cashback, the colour/dimensions of the item, any comparative products, the day of the week, whether the member voting had run out of butter for their morning toast, or anything else connected/unconnected with the "Deal"), apparently. "If you are cold voting a deal, it is good forum etiquette to post a note in the deal as to why you have done so. There is nothing more confusing to a new member, than to post a deal, only to see it go cold with no explanation. If you found the item cheaper elsewhere, please let us know where and how. If you have no interest or knowledge about the deal at all, please don’t vote cold, just move on. HUKD has systems in place to detect serial cold voters, and it may lead to a ban from the forums, as it is against the code of conduct." If members feel an apple product, for example, is comparable with another item and they do not think the apple represents good value, then of course they should state that within the thread. However we cannot be too strict with regards to forcing members to justify their votes. It will be detrimental to how the site works and the organic nature in which "hot" deals are voted as such. Also, "Cold Voting", & the ironically-titled "EXPIRED - Can you get banned for voting cold too often?" (created by a member that is now banned). Unfortunately, this last link no longers works with the redesigned site either. Poor, inferior product. Why anyone pays this much for Yankee candles is beyond me. They smoke loats, have no real depth, and they look cheap. Try Woodwick. Last year at about the same time Yankee did an offer (a code I seem to remember) and got them for £11 which was a good deal - so similarly hot! Although, in terms of the product, I do think there's better out there. Can vouch for the sellers quality as got 3 large for 11.99 each last week. Proper Yankee and good packaging. Poor, inferior product. Why anyone pays this much for Yankee candles is …Poor, inferior product. Why anyone pays this much for Yankee candles is beyond me. They smoke loats, have no real depth, and they look cheap. Try Woodwick. Volkswagen own Skoda. Different products entirely. I wouldn't fragrance my dog's kennel with WoodWick. Yankee all day long. 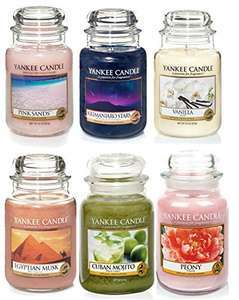 Fab price, Yankee candles all day long for me, bought cheaper and they're nowhere near as good. 65 rips for candles,jeez the worlds gone mad...do these bad boys washes the dishes for you as well. 65 rips for candles,jeez the worlds gone mad...do these bad boys washes …65 rips for candles,jeez the worlds gone mad...do these bad boys washes the dishes for you as well. Wax in a glass jar....you can sell these suckers anything and they'll lap it up. It is 3 for £28 (i.e. 6 for £56 in my local tesco store Southend-on-Sea A127). It is 3 for £28 (i.e. 6 for £56 in my local tesco store Southend-on-Sea A …It is 3 for £28 (i.e. 6 for £56 in my local tesco store Southend-on-Sea A127). I'm grateful. This is a good price for 6 presents. I won't comment on the actual value of Yankee over any other candle but when giving gifts its generally appreciated that you got the real thing and not the pretender. Would I buy this for myself? Never. I will buy it to give something to my wife, mother, mother-in-law something they'll appreciate. And if I can do that at £10 a candle then I'm laughing. Saying that, air fresheners are probably bad for you too. i was sceptical for years about these yankee candles and couldn't believe people shelled out so much money for a candle.